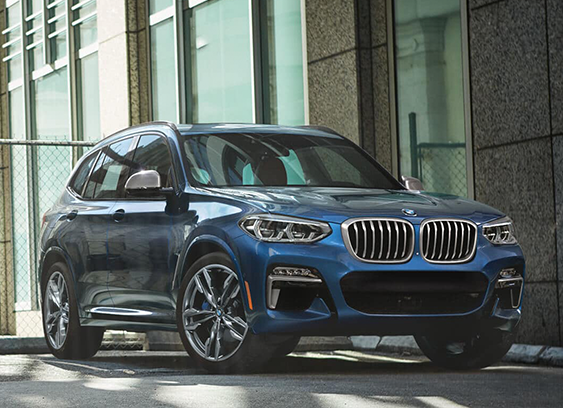 Advantage BMW of Clear Lake invites you to learn more about the completely redesigned 2019 BMW X3 near Houston, TX. Explore all the specs and options of this completely redesigned sport activity vehicle. The 2019 BMW X3 looks remarkable at any angle. Taking a look at the front of the car you will clearly be attracted to the huge air intakes, upgraded headlights and the traditional BMW ‘kidney’ grill. The new M Performance version of the X3 consists of a 355 horse power 6 cylinder engine, self-leveling, adaptive LED headlights, satellite radio and hands free entry as part of the general performance package. Throughout all 2019 X3 lineups, BMW currently offers an optional factory installed trailer hitch for the first time. The 2019 BMW X3 has an outstanding checklist of standard features consisting of, 3-zone automatic climate control, including separate temperature controls for the back seats, 1st row LCD display, and heated mirrors. Upgrading to the Premium trim level gets you a Heads-Up Display that is 75% larger than in previous versions, heated front seats, navigation, and Apple CarPlay™. The Executive package includes some really awesome technical wizardry like Surround View with 3D-View, Gesture Control, Full LED Lights, and Automatic High Beams. Inside the X3’s sporty cabin you will discover everything you require on an optional 12.3-inch touch-screen including the vehicle’s smart device connectivity, sound system, and multimedia options. The optional Navigating system places the country at your fingertips. The most up to date version of iDrive responds to touch, voice commands, and optional Gesture Control while the Heads-Up display screen projects the vehicle’s speed, the speed limit, collision warnings, and navigation guidance onto your windshield. Want to learn even more about the 2019 BMW X3 near Houston, TX? Visit Advantage BMW of Clear Lake online, in-person, or call us to schedule a test drive.